CATHOLIC GIFT SHOP LTD - Lourdes Water Cross Bottle & Rosary Gift Set. 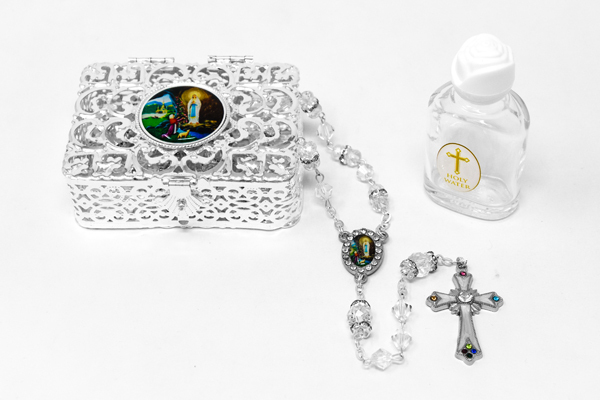 Lourdes Water Cross Bottle & Rosary Gift Set. Rose top bottle of Lourdes, measures 6 cm tall (2.3 inches). Strass crystal rosary beads, with a colourfull centerpiece depicting the Lourdes apparitions, the rosary is approx 19 inches long. Silver rosary box depicting the apparitions at Lourdes.